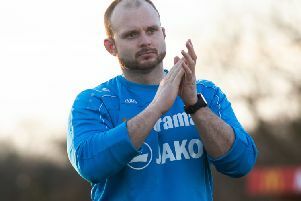 Hemel Hempstead Town boss Dean Brennan admitted he was disappointed not to have picked up all three points as the Tudors drew 1-1 at high-flying Bath City on Saturday. Hemel went in front against table topping Bath through an Oliver Hawkins header, but the hosts hit back after half-time courtesy of an effort from Aden Baldwin. “I’m disappointed we didn’t win to be honest because I thought we did enough to have won the game,” said Brennan. “We should have got ourselves two goals in front and we looked comfortable enough. Hawkins had a late effort disallowed for offside, and Brennan felt it was a decision which cost his side a deserved victory. “We had a goal chalked off in the last couple of minutes of the game and I have watched the video back – I didn’t think it was offside at the time and it wasn’t,” said the Hemel boss. Hemel have been on the wrong end of a number of refereeing decisions in recent games,but Brennan isn’t using that as an excuse. “We’ve been a little bit unlucky of late but the harder you work, the luckier you get, and I truly believe that,” he said. “For us, is it a good point or is it a bad point? Only time will tell. We’ve led three times in the last two games and we haven’t managed to take maximum points in either of them when I felt we deserved to. Next up for Hemel is a National League South clash with Hayes & Yeading United at Vauxhall Road tomorrow night.